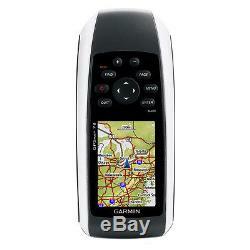 Garmin GPSMAP 78 Handheld Portable Marine GPS Navigator/Chartplotter Waterproof. Garmin GPSMAP 78 Garmin international is pleased to announce the next generation in marine handhelds: the GPSMAP 78 series. Featuring a bright 2.6-inch LCD color display with built-in basemap and high sensitivity GPS receiver with HotFix, the GPSMAP 78 series takes recereational navigation to a new level. All three models are waterproof, include a built-in microSD card slot for loading additional maps and have a dedicated MOB (man over board) button. If you're looking for the ultimate high-performance marine handheld, take your pick from the GPSMAP 78 series. High-sensitivity, WAAS-enabled GPS receiver and HotFix. Rugged, waterproof (IEC 60529 IPX7). Worldwide built-in basemap with shaded relief. 1.7 GB of internal memory, plus microSD card slot for optional mapping and data storage. Bright 2.6 LCD sunlight readable color display (160 x 240 pixels). Up to 20 hours of battery life, battery type: 2 AA (not included) NiMH or lithium recommended. Weight: 7.7 oz with batteries. Package Includes: Unit, USB cable, wrist strap and quick start manual. Built-In Memory: 1.7 gb. Box Dimensions: 2"H x 6"W x 7L WT: 0.9 lbs. The item "Garmin GPSMAP 78 Handheld Portable Marine Waterproof GPS Navigator/Chartplotter" is in sale since Monday, February 22, 2016. This item is in the category "Consumer Electronics\Vehicle Electronics & GPS\GPS Units". The seller is "thesmarte-mart" and is located in Bayville, New Jersey. This item can be shipped worldwide.